We were looking for mold, but found the door. I didn’t want to open it. You didn’t want to open it, so it opened itself for us. When I looked in I saw blue-green soft, organ-like shapes growing from the walls, a footpath that curved into darkness. The room breathed, gill-like and I swore a thousand bluish eyes shifted and focused. When you looked in, you wouldn’t tell me what you saw. I tried to insist you saw the blue-green organs, the path, monsters, death—what mattered. You held my foot as I said, I’m going in. I’ve been there. I can come back. You said, We don’t have to decide this now. I got on my hands and knees to wiggle through the wooden beams that held up the remaining drywall. I felt humidity move like a breath of air. Stay with me, you said, I’m not letting go. I sat back in a squat and looked at your hands, thinking, Well, okay. That’s good. The door shut all by itself. We turned to watch it lock. 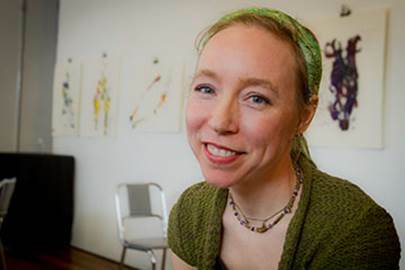 Laura Madeline Wiseman is the author of twenty books and chapbooks and the editor of Women Write Resistance: Poets Resist Gender Violence (Hyacinth Girl Press). Her recent books are Drink (BlazeVOX Books), Wake (Aldrich Press), The Bottle Opener (Red Dashboard), and the collaborative book The Hunger of the Cheeky Sisters (Les Femmes Folles) with artist Lauren Rinaldi. Her work has appeared in Prairie Schooner, Margie, Mid-American Review, Ploughshares, and Calyx. Visit her online at lauramadelinewiseman.com.